The breed name, Kerry Blue, dictates color should be very important to “type.” No other breed can lay claim to the same color, making that distinctive color the breed’s crowning glory. 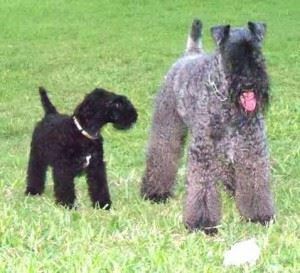 “Up to 18 months any doubt as to whether a dog is black or a very dark blue should be resolved in favor of the dog, particularly in the case of a puppy, and deviations from the correct mature color are permissible without preference and without regard for uniformity.” If an exhibit is under 18 months of age, color is not an issue in judging therefore, color can not be used as a reason to disqualify. The leeway the Standard gives color is considerable however after 18 months a dog should present proper, mature color or it should not be in the ring. The Standard states, “The correct mature color is any shade of blue gray or gray blue from the deep slate to light blue gray, of a fairly uniform color throughout except that distinctly darker to black parts may appear on the muzzle, head, ears, feet and tail. Black on the muzzle, head, ears, tail and feet is permissible at any age.” Breeders refer to this as dark “points” — Some kerries will have darker “points” on a coat of correct color. Black points are acceptable at any age and many breeders find such dogs to be particularly desirable. The Standard gives this feature no preference.